Today we carry on with the 30 Day Tarot Challenge, set by Ree at 78Keys over on Tumblr. Her question today is this: For what purposes do you usually use the Tarot (self-reflection, guidance, advice, recreation, communing with spirits/dead, communication with deity, other)? If you’ve visited and reviewed my site, you’ll know that my aim is to help you find the answers you want with the power of Tarot, and that I don’t plan on saving the world, just provide Tarot readings in a friendly and convenient manner. That’s my “sales” pitch, but what do I use it for? What questions can be asked to help you (or myself) find the answers? Well, I can tell you what I do use it for. I use it for self-reflection, for the clients and for myself personally. I use it for personal guidance, advise and meditation. I’ve used it to connect with and find my Spirit Guide and learn about her. I’ve used it in Workshops to explore how others use it to commune with deities and how some readers do predictions, connect with the i-Ching, Numerology and Mythology. I’ve also used Tarot in building up my Tarot business, to take advise on what the next step would be and used decision spreads to help work out how certain things might work out. Or not, as the case goes. In most decks, the Queen of Swords is your clear advisor, the one who will cut through the cloud of chatter (or that smelly stuff we all call bull****) and tell you exactly how it is, even if you don’t want to hear it and she’ll tell you this because you asked. In the Wildwood, that’s the Queen of Arrows: Fierce, protective, straight to the point, graceful, alluring, refreshingly honest. The Queen of Pentacles is more your business woman (Pentacles equates to money, job, home) and she’s good with the money and getting things like projects and practical things taken care of. Combine these two ladies and you’re in for a sure winner. The Tarot is like a mirror, it reflects only what it sees, but these are just 78 pieces of card. Aren’t they? If you’d like to see how this works (rather than have me explain it) you can book your session with me via this page. I don’t bite, honestly! 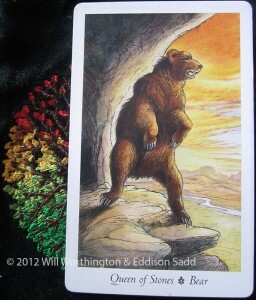 I don’t have experience with Tarot cards at all, but self-reflection is my middle name! So I think this would be fun to investigate. I’m not sure whether it’s meant to rest on some deeper religious or spiritual worldview, but it looks intriguing as one more way to peer into myself. I love the images on the cards you show here – lovely! I also love that you are so bold and open while not being defensive about your practice. This blog post is a pleasure to read! I’ve believed for a long time that the Tarot is like a whole bunch of archetypal road maps that can lead our higher self to shine the light of intelligence on a particular piece of information that we need. Do your earlier blog posts discuss how you envision your practice at a spiritual level? If so, would you be so kind as to point to them for me? If not, hey what do you think of that as a future blog post? I tried to post this once, if it duplicates, please delete one if I can’t. Donald: I too believe that the Tarot is a reflective tool. There are 78 cards, certainly more than enough to depict daily / life time events, especially when you start combining them! I know a woman who does a 10-minute free reading every time I see her and she is spot-on! It’s all very fascinating to me! I have no interest in learning what all the cards mean – but I do love having mine read and seeing if what is said to me comes to fruition! I am in awe of people who can totally learn this kind of art. I play with the tarot myself for a little guidance but I mostly use it to get in touch with my intuition, as a tool to help with that. I was disconnected from my intuition for too long and love how these tools are bringing me back. I like this tarot pack. So far I have the original Ryder Waite and the Witches Tarot. This is a world I don;t know much about .. but I am intrigued and in awe of it all! Thanks for sharing. I love cards! I have a few decks that I use sporadically when I need deeper assistance. Nothing really “tarot” but Colette Baron Reid’s Wisdom Oracle cards and a couple of Doreen Virtue’s Angel decks. I have a couple of true Tarot decks but don’t really understand them that much. I like things simple and light! Great post! Love the messages that the cards bring and how they always tie in to where we are. I think being able to pull out signs from picture cards or numbers … just pulled three cards wondering if one of the queens would show up but instead The Sun, The Chariot and Two of Pentacles…..feels like a journey to me but I know little so I must go seek the meaning. I am pretty sure you dont bite. The Sun is a great card! Did you attribute any meanings to the positions, Jen? 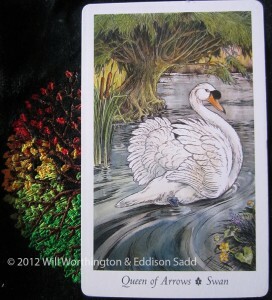 I love your description of the Tarot cards and that they can be used for many purposes. I especially like the self-reflection a reading can promote and may even do one myself. : ) Nice, Priestess Tarot! Thank you. What deck do you use for yourself?